Frontispiece of Franz Wilhelm Junghuhn's main work "Java, seine Gestalt, Pflanzendecke und innere Bauart". A painting of Junghuhn as a fronispiece of an article on him. 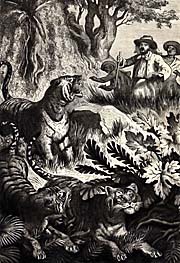 Junghuhn's encounter with a Javanese Tiger. Image from S. Friedmann, "Die Ostasiatische Inselwelt" (1868). 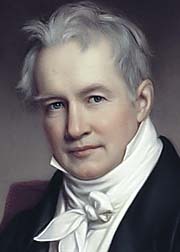 Alexander von Humboldt (1769 - 1859), paradigmatic explorer and natural scientist. Junghuhn and Humboldt were in contact to each other and Junghuhn is mentioned in Humboldt's main work "Cosmos". One of, if not the most paradigmatic explorer of the 19th century was Alexander von Humboldt, who thorougly explored and mapped parts of Europe and South America. Franz Wilhelm Junghuhn, although widely forgotten, represents a talent of the same size. 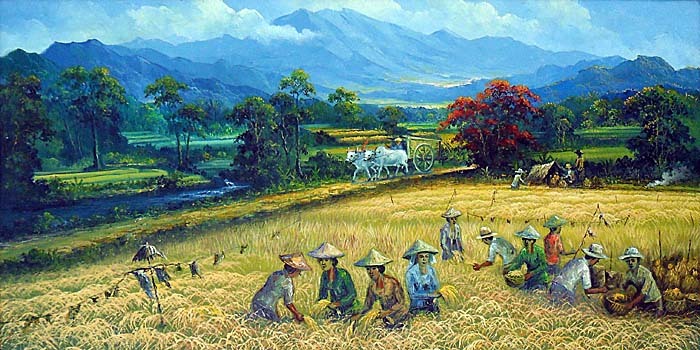 Unlike Humboldt, who came from the rich background of a noble family and got from young years on all the support one can wish to develop great talents and could finance all his expeditions by his own fortune, Junghuhn was born into a simple family and was initially forced into a way of life he really didn't want. Severe struggles with his father shaped a strong character who never avoided conflicts with authorities when he was convinced it was necessary for a good reason. 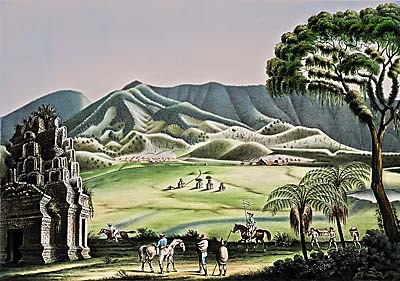 Franz Junghuhn completely explored Java's geography, geology and botany. He created the first reliable map of whole Java and countless of particular maps of Javanese regions, including the Dieng Plateau. He was also the first who mapped the southern Batak territories on Sumatra. A breakthrough in botany was his successfull cultivation of Peruvian bark trees (quinine production) on Java. Junghuhn's writings are among the best of the worlds geographic literature and influenced many scientists. His main work "Java, seine Gestalt, Pflanzendecke und innere Bauart" (1857) contains an incredible variety of detailed information on Java's nature. Creating a great scientific work he died much too young in the age of 54 years. I suppose he would have done much more in his later years, particularly because he had many resources to do so in the last years of his life, which he lacked in earlier years. His biography reads like a 19th century adventure novel. 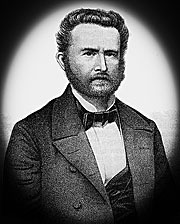 Franz Wilhelm Junghuhn was born in 1809, the age of the Napoleonic wars, in Mansfeld, east Harz mountains, middle Germany (in this time part of the 'Kingdom of Westphalia', ruled by Napoleons brother Jerome). His parents were little people; his father was kind of a surgeon. 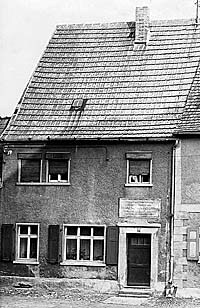 Junghuhn's birthhouse in Mansfeld / Westphalia. As the first born son he was expected to support his parents (financially) until their dead. For that purpose his father wanted him to become a doctor. Learning a decent profession to earn money with. But young Franz didn't want that. He was interested in sciences, above all in botany. Though, he had no alternative than to submit to the families demands. At a first step he got private lessons from a clergyman, Carl Hecht. Hecht was so strict and religious conservative, that Junghuhn got a deep aversion against Christianity for the rest of his life. Nevertheless, learning Latin in this time prepared him for his later works and studies. After starting medical studies in Halle, he spent parallel plenty of time strolling and hiking around in the nature with his also nature-loving friends Oswald Heer und Hermann Burmeister, studying the wider surroundings botany. The successful graduation of the medical studies was a condition to get access to botanical studies, what was his plan for afterwards. His father didn't agree to that and didn't support the original medical studies anymore but changed it into another, quicker medical studies, knowing that it wouldn't allow a following matriculation in botany. Due to that there followed a serious conflict between father and son. Junghuhn didn't change his study but followed the original one. The financial support was then cancelled. Due to that Junghuhn came in such a trouble paying his bills, that he had to sell his bed and all the other bedroom equipment, and even his precious books. He tried to survive with casual jobs, and made it for 18 month, but it didn't run well. The situation became so hopeless, that he tried to commit suicide in the age of 21 by shooting a bullet into his head. He survived being heavily hurt at his head, needing an operation. His father, though still mocking about him, granted him to stay in the families house until recovery. 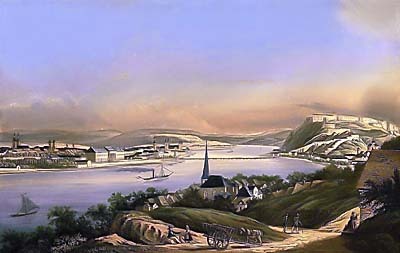 Festung Ehrenbreitstein in Koblenz (in a 19th century painting), on top of the hill at the right, where Junghuhn spent a year imprisonment. In the 1980s there was a youthhostel inside. The river is the Rhine at the confluence with the Mosel River. From 1830 to 1833 he continued studying medicine, this time in Berlin. The study ended dramatically. In a Berlin restaurant he had a severe confrontation with a Swiss student. A pistol duel was arranged. Junghuhn was shot in his left upper leg; the Swiss guy wasn't hurt. Since duels were strictly forbidden, he got sentenced to ten years imprisonment in a military fortress. He was imprisoned in the fortress of Ehrenbreitstein, Koblenz. After a year in jail Junghuhn simulated a breast suffering and was transfered into a military hospital. Next he simulated a mental illness. After a time he could successfully escape the hospital and fled to France. In Toulon he registered into the foreign legion and was sent to Algeria. After another six month he was dismissed and went to Paris. Here he came in contact with significant botanics and started to discuss his ideas and experiences. One of them advised him to go to the Malayan Archipelago; what he later did. To go to the 'Dutch East Indies' (nowadays Indonesia) was for Junghuhn only possible when he got a job in the Dutch Army. After he examined as a doctor he enrolled as a sanitary officer in the Netherlands. He arrived in Batavia (Jakarta) in 1835 after a three and a half month during passage from the Netherlands. On Java he again spent a lot of time in hiking through the mountains and studying botany. Being accused of neglecting his official work brought him in some trouble with authorities and colleagues. 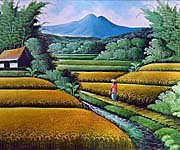 When he came to Yogyakarta he continued and examined all the surrounding mountains, above all Mount Merapi (1836). He climbed the Merapi several times and documented the volcano in detail. He also climbed Mount Merbabu and documented it. 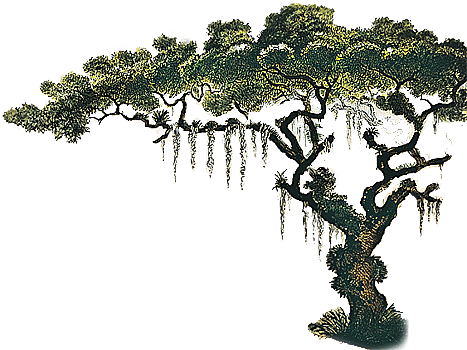 In 1837 a new superiour of Junghuhn very much appreciated his interests and abilities and let him join a series of journeys through Java, exploring great deals of Java's nature, the coasts, rain forests and many volcanic mountains. Among them were also the Tengger Mountains with the active volcano Bromo and the high plain of the Dieng Plateau with it's numerous craters and lakes. The excursions were done for a number of scientific purposes. Junghuhn's part was to explore the botany. In the 1840's he went back several times to the Dieng Plateau and mapped it so precisely that the map stands even nowadays comparisons with satellite photos. After years of elaborate studies of Javas plant live Junghuhn, still under army contract, was by his own wish ordered to Sumatra. In Padang he met Pieter Merkus, the General-Commissair of Sumatra and later General Governour of the 'Dutch Indies'. The high ranked official realized Junghuhns capacities and sent him to a mission to explore the Batak territories at the northern west coast of Sumatra. It was an adventurous task and Junghuhn was glad to get rid of the military service. The Batak territories were completely white spots on the maps in 1840. Contemporary maps contained only skylines of the mountains who are to see when passing along Sumatra's west coast on a ship. It wasn't safe, for the Bataks are resistant people, living deep in mountainous forests. They always kept themselves in isolation. Junghuhn's orders were manyfold. He had to map the region, explore the climate and the fertility of the soil, explore usable natural sources, particularly wood for ship building. About the Bataks he was wanted to find out as much as possible, their political attitude, language and alphabet, customs and, of particular interest, their notorious cannibalism. 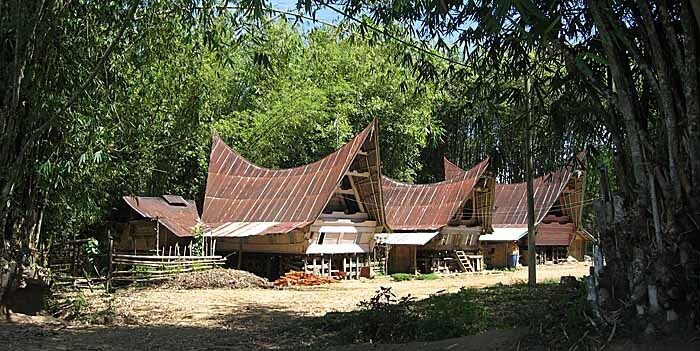 The Batak Village Gudarim Baru. Image from Junghuhn's publication "Die Battaländer auf Sumatra" (1847). Franz Junghuhn landed in October 1840 together with his scientific assistent Hermann von Rosenberg in the bay of Tapanuli on an island hosting a Dutch fortress. That's near where is nowadays the town of Sibolga. 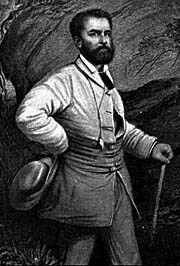 Soon after they started the expedition into densly forestred Sumatra, Hermann von Rosenberg got lost in the jungle while hunting. Junghuhn could find and rescue him, but Rosenberg suffered a severe fever and had to be brought back to the next bigger Dutch settlement. 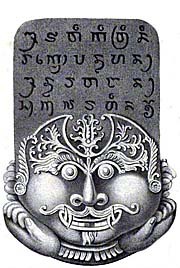 Junghuhn, nevertheless, continued alone exploring the southern Batak countries. Penetration and surveying the land brought him to the borders of his physical and also mental abilities. The local Batak were some years before havoced by martial Malays and were very suspicious about strangers. By the way, Bataks always were very suspicious about strangers, including Bataks from other tribes. Eventually it became impossible to continue further northwards, towards Lake Toba and the Batak Karo mountains. 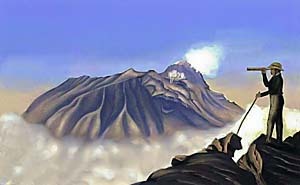 In the 18 month he spent on Sumatra, Junghuhn was ten month sick, lying in his basic camp south of the volcano Lubu Radja. He suffered dysentery and the inflammations of some of the countless bites of leeches. In Tobah the locals denied me to survey the land with the argument, it would serve the purpose of the erection of a fortress. In Hurung I could only observe the surroundings when hiding in bushes, for similar reasons. In Silingdong my work got forbidden for it were pure magic. I was urged to pack my things and leave the area. Additionally there are the mountains with all the steep slopes. It's only possible to move on foot. In one day one has to cross 30 to 40 streams, some of them very cold, others are warm or even hot. Crossing a stream or river means to put all the equipment above the head, because the water somtimes rises almost up to the shoulders. In daytime one is plagued by masses of small leeches who come by 20 or 30 and creep under the clothes and bite anywhere on the body; they even bite through socks and trousers. The bites cause painful furuncles. In nighttime therefore are always mosquitoes around. Most of all one has to mind safety, to load at least six rifles and keep rotational guarding awake with the servants to scare the locals away." Not to speak about the weather. I personally experienced on several journeys the heaviest rainfalls in Batak countries on north Sumatra. It's pouring an immense amount of big raindrops, mostly starting in the afternoon. Then it's raining for at least some hours, sometimes throughout the whole night. It get's really dark; there must be huge clouds queuing in the Batak mountains, coming from the Indian Ocean. Next morning it's usually sunny again. As more surprising is what Junghuhn obtained in the eight month he was half the way healty and could act. Despite all the suspicion he could find out much about all the aspects of culture and all-day-life of the Bataks. Above all he managed very well to survey and map the southern Batak territories in detail with the sophisticated techniques of his time. He showed an enormous strength of will to accomplish the mission. Not even the much more developed island of Java was mapped that well in the time as the southern Batak territories by Junghuhn. His maps were the basic tool for all the Christian missionaries who came in the following decades into these areas to convert the Bataks to Christianity (including local celebrity Ludwig Ingwer Nommensen). Some of them ended up as food for the cannibals. Junghuhn, on his part, was personally against the conversion of local people to the Christian religion, as he made clear in his book "Licht- und Schattenbilder aus dem Innern Javas". The maps also include the first mapping of Lake Toba, although only after descriptions of Batak people, because it wasn't possible for Junghuhn to reach Lake Toba on his expedition. Fifty years later, around 1890, the Dutch colonial power subdued the whole Batak countries in the 'Batak Wars'. In the Dutch - British confrontation in the years between 1800 and 1824 the Dutch authorities lacked a map of whole Java. A first map was finished in 1812, in the time when Stamford Raffles was Governor of Java. The map also appears in Raffle's work 'The History of Java' (1817). This map was still widely inaccurate and contained faults and white spots - in fact it was barely usable. After the successfull mapping of west Sumatra Franz Junghuhn got the order to map west Java, then east Java. The results marked a breakthrough in mapping. In the following years he published a number of scientific articles, most of them about the Javanese volcanos. 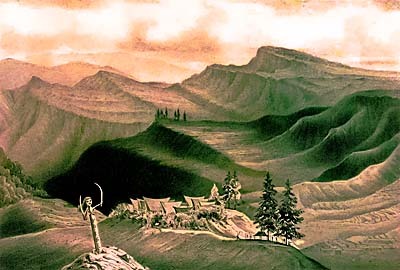 The Dieng Plateau, which was mapped by Junghuhn. The map is almost as good as a satellite image of our days. The temple at the left is clearly Candi Bima; the small temple group in the center is the Arjuna Complex. Behind it lies Dieng village. Painting out of Junghuhns main work "Javas Gestalt, Pflanzendecke, Innere Bauart". In 1844 Junghuhn got eventually rid of the loathed post as a doctor in the military and became a member of the Dutch 'Natural Scientific Commission'. That's what he always wanted. Now he could fully concentrate on his scientific works. Writing articles for the 'Natural Scientific Commission' he criticized nuisances in the colonial system and blamed high authorities. He also blamed in an eye witness report the fights between buffalos and tigers, a game for Javanese nobles called 'Rampok' at the court of Solo (Surakarta), and criticized the Susuhuan (Sultan) of Solo. That all triggered a long chain of conflicts he would have from now on with the Dutch colonial Government until his death. In 1848 Junghuhn went back to the Netherlands for a cure of his struck health. The years until 1855 he spent in Europe, most of the time in the Netherlands, continuing his main work "Java, seine Gestalt, Pflanzendecke und innere Bauart" and another, anticlerical publication with the title "Licht- und Schattenbilder aus dem innern Javas". In these years he also visited his mother in Germany (his father died already in 1844) and married the daughter of a Dutch officer, Johanna Koch. He also adapted the Dutch citizenship, mostly for legal reasons on his works who were first published in the Netherlands. Some biographers claim he visited in this time also parts of Italy, the Pyrenees, Sweden and parts of Russia, even so far away east as until the Altai Mountains. This information is not verified. Sure is that he spent most of the time in Holland and that little time was left for such time-consuming journeys through greater parts of Europe. In 1855 Junghuhn published an updated map of whole Java (Kaart van het Eiland Java, his masterpiece), what marked his fame as the explorer of Java. Due to an recommendation by Alexander von Humboldt, Junghuhn was invited to the Prussian King Friedrich Wilhelm IV to castle Sansoussi near Potsdam. Again and again he was ordered to explore certain parts of Java, e.g. for exploring coal ressources or other natural sources of interest for the Dutch Government. While travelling he always continued his explorations of botany, geography and other scientific topics. These journeys also contributed to a continuous perfection of his map of Java. 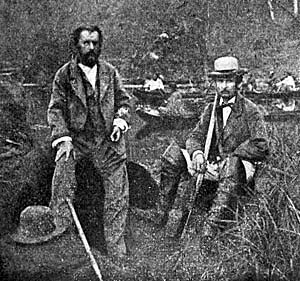 Franz Junghuhn (left) and Ferdinand von Richthofen on a journey on Java in 1861. In service of the Dutch Government the German botanist Justus Karl Haßkarl brought Peruvian bark trees (illegally, by the way, for gaining quinine as a medicine against malaria) from Peru to Java. First trials to grow them up there failed. Then Junghuhn was deployed as the director of the Peruvian bark plantages. After transfering the trees to a higher altitude and taking other measures they grew well. That was the foundation for that the 'Dutch East Indies' later emerged to the world's biggest quinine producer. Still nowadays Indonesia is together with Malaysia and Kongo among the biggest quinine producers. A number of famous people of the time visited Junghuhn in his last years in his house in Lembang in the mountains north of Bandung. Among them was the Berlin ethnologist Fedor Jagor and the ethnograph and later China explorer Ferdinand von Richthofen. Junghuhn always created itineraries to show his guests as much as possible of Javas natural and cultural riches. On the journey together with Richthofen he caught a dysentery and never completely recovered from it. In 1864 he got a liver disease and died from it after a few months of suffering in his house in Lembang. A satellite map of Java from 2007 compared to Junghuhn's map from 1860, which was made by comparably very simple means. There weren't even planes at this time to shoot aerial photographs. Junghuhn's map measures 79cm to 308cm and is among the very best what was ever made in the history of mapping. 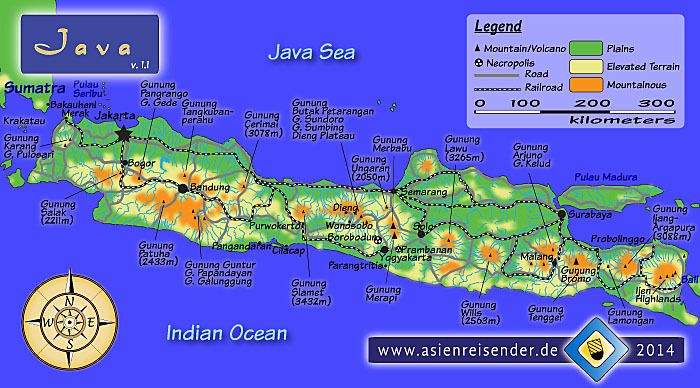 A map of Java by Asienreisender. For an enlarged, interactive 'Map of Java' click the link.